"The Ladies' No. 1 Detective Agency"
The Paul Picnic from Bev Sykes on Vimeo. I lucked out tonight. I nearly had a "first" in all the years I've been reviewing theatrical productions, and fortunately it never happened. I've done some weird things in theatres. I've kicked a zebra that made a whinny-ing noise in the middle of a serious soliloquy, I've accidentally turned on my tape recorder in play mode without knowing I had done it and, with everyone else, looked around in annoyance, wondering who was so rude as to disrupt the production. But I've never gotten sick in a show. Until tonight. 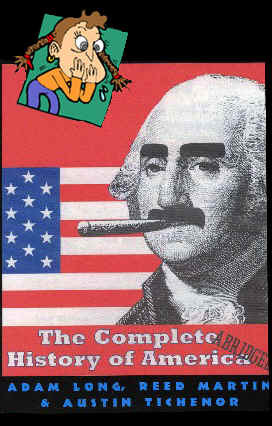 We had gone to see the very funny "The Complete History of America (Abridged)" at Capital Stage. I was anxious to see this play for several reasons. For one thing, one of the authors of the show is Austin Tichenor, an acquaintance from the Lamplighter days (whom I last saw a month or so ago at a memorial service). But for another, Stan Freberg's "History of the United States of America, Part 1" has been a HUGE favorite in this house. Everybody can quote bits of it. Walt and I can toss out lines like "rumble...rumble...rumble" and have the other respond "mutiny... mutiny... mutiny" and mystify everyone (except Bozoette Mary and her Joe, of course). We know the real story behind the Boston Tea Party and that the Revolutionary War would never have been won without the assistance of "the skinny kid with the pipe" (Norman Rockwell) who painted a backdrop that fooled the British into thinking there were more American soldiers than there really were, and that the real reason Cornwallace surrendered was because, as a losing country, he could then apply for financial aid from the rich Americans. So I was curious to see how this version of our country's history compared with Freberg's, and it's pretty much a totally different view, much more zany, much more high energy. You don't come out humming "It's a round, round world" or "Take an Indian to lunch this week." But then Freberg never made it to the stage, so he didn't have to deal with the quick costume changes either. Anyway, the new version of history is very funny and I was enjoying it until about 15-20 minutes toward the end. I had cooked dinner before we left, but my stomach was feeling unsettled and it just didn't seem appetizing (though it is one of my favorite casseroles), so I hadn't eaten anything. I took a sip of water from the bottle that Walt bought for me before the show and all of a sudden there was that unmistakable water-in-the-mouth feeling that precedes vomiting. We were sitting in seats that were dead center of the row and I would have to climb over people to get out, but the feeling kept coming in waves. The problem was that I wasn't sure how much time I had if I got up. Could I, for instance, make it past the people I had to climb over without decorating their laps. And I frantically thought about the theatre lobby. Would there be a receptacle right THERE if I were successful in getting out the door? One of the problems with having a "bladder of steel" is that I rarely go to the restroom in theatres and so though I've been to this one frequently, I had no clue whether there was a restroom downstairs or if I would have to go upstairs and try to find one there (we were on a river boat, which has restaurants and hotel upstairs and theatre downstairs). There just was no good option. I finally decided to stay where I was, clamp my hands over my mouth, breathe deeply, pray, and hope for the best. There were 3 waves of nausea, but then, thank God, it passed. I hope never to have that experience in a theatre again! Tomorrow night we're going to see The Lion King (yawn)...last thing I need to do is throw up on the elephant as it parades down the aisle to the stage.